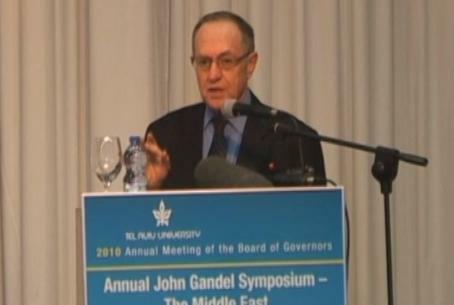 Prof. Alan Dershowitz decries Arab 'dead baby strategy' which induces Israel to kill as many Arab babies as possible. Noted lawyer and Israel advocate Professor Alan Dershowitz said Tuesday that Israel's biggest problem are Israel-bashing Jews like Norman Finkelstein and Gilad Atzmon. He said some people live on what he calls “Planet Chomsky” -- a reference to the Jewish ultra-leftist MIT professor who has met Hizbullah's leader Nasrallah. Dershowitz explained that Israel's Arab enemies employ a “dead baby strategy.” They want to induce Israel to kill as many Arab babies as possible so that they can use the photos of the babies in their propaganda.